We start with a straightforward case. Consider a single period of time, say, a year. We have two stocks, L and U, which have the following characteristics: Stock L is expected to have a return of 25 percent in the coming year. Stock U is expected to have a return of 20 percent for the same period. In a situation like this, if all investors agreed on the expected returns, why would anyone want to hold Stock U? After all, why invest in one stock when the expectation is that another will do better? Clearly, the answer must depend on the risk of the two investments. 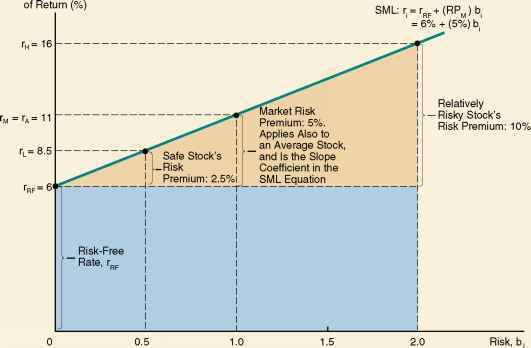 The return on Stock L, although it is expected to be 25 percent, could actually turn out to be higher or lower. For example, suppose the economy booms. In this case, we think Stock L will have a 70 percent return. If the economy enters a recession, we think the return will be —20 percent. In this case, we say that there are two states of the economy, which means that these are the only two possible situations. This setup is oversimplified, of course, but it allows us to illustrate some key ideas without a lot of computation. Suppose we think a boom and a recession are equally likely to happen, for a 50-50 chance of each. Table 13.1 illustrates the basic information we have described and some additional information about Stock U. Notice that Stock U earns 30 percent if there is a recession and 10 percent if there is a boom.